Local Radio with Phil features one of our newer presenters, Phil Harris, from 12 noon to 3 pm each Monday. 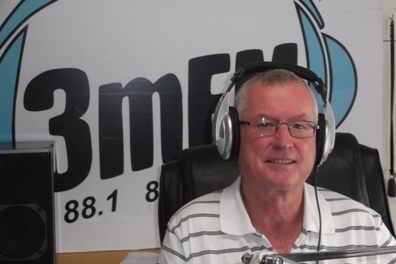 Phil will keep you entertained with great music and let you know what’s coming up through the week. I always had an interest in music, my first musical instrument was the school recorder! I actually discovered I had an ear for picking up songs from the radio to play on it. I listened to all the DJ’s of day, Stan ‘The Man’ Rofe was my favorite and actually wanted to get into that but we didn’t have career advisors back then so it didn’t happen. I self taught myself the guitar ( badly ), and at one time when I was around twenty fronted a local rock band. I saw an article in the Sentinel Times on how to become an announcer so I contacted Wendy, went for an interview and here I am. As I have said, a boyhood dream come true! Things these days for announcers must be a lot easier than back in the day when the DJ spun all the 45’s on two turntables. I still find I have to keep my wits about me though !